China’s leading luxury yacht and business jet show the Hainan Rendezvous opens its doors for the 3th edition of the event. SuperYachtTimes.com and YachtsXL are not only official media partners of the event, but also run an on-site Media Centre. 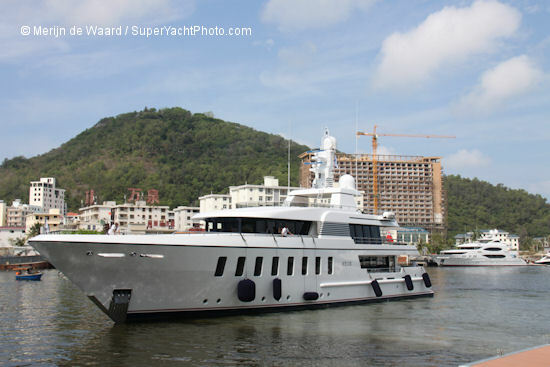 In this new venture SuperYacht Company, owner and operator of SuperYachtTimes.com, and YachtsXL have joined forces to engage High Net Worth Individuals from Asia to the world of luxury superyachts and to promote Asia as a destination to superyacht owners by producing high quality videos, photos and articles. This Centre is an on-site content production pavilion from where a team of 10, including photographers, writers, cameramen, editors and managers produce live content on the Hainan Rendezvous. On each event day of the event the team will produce daily video clips, artcicles and photos on the exhibitors, events, yachts, jets and all other happenings. "The created content will be cross-media published and distributed. We do not solely offer news and video to our publishing platform; but also a large network of partners in the luxury and yachting media world plus a large social media network”, says Maik van Zoggel director of YachtsXL. In addition, the created content will also be published and distributed to smartphone and tablet applications, connected TV’s and major print publications. Companies who are interested in a video production, photo-shoot or article during the Hainan Rendezvous can contact us. Interested media companies can also contact us if they are interested in videos, photos and articles from the Hainan Rendezvous. The content is available free of charge to approved media.